Young Americans, whose embrace of new technologies and social networking tools enable them to adopt new ways of getting around, are beginning to change the nation's transportation landscape. They don't drive nearly as much as young people once did: While all Americans are driving less since the recession, the average person ages 16-34 drove 23% less in 2009 than in 2001, the sharpest reduction for any age group. And some of the nation's youths — those known as Millennials, born between 1982 and 2003 — approach travel differently than their parents do. 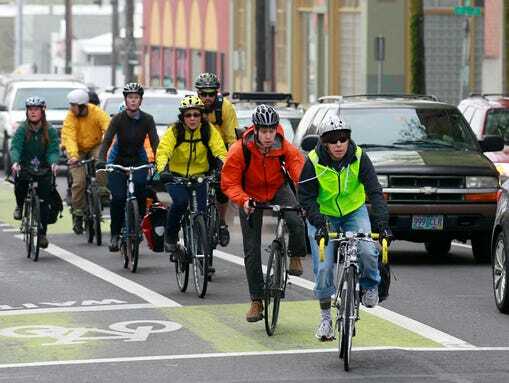 They are "multimodal," meaning they choose the best mode of transportation, such as driving, transit, biking or walking, based on the trip they are planning. They consider public transportation the best option for digital socializing and one of the most likely ways to connect with the communities they live in. They also say that transit allows them to work while they travel. These are among the findings of two new reports released Tuesday at the American Public Transportation Association'sannual meeting in Chicago. The first, from the U.S. Public Interest Research Group, found that online and mobile technology have fundamentally changed the way Americans live and work over the past 15 years; during the same period, growth in vehicle travel slowed and then stopped. U.S. PIRG suggests that these two developments are connected. There has been "an extraordinary shift" in how people travel, said Phineas Baxandall, author of the PIRG report. "For eight years in a row, Americans have been driving less on a per-person basis than the year before," he said. At the same time, the PIRG report notes, there have been increases in the use of the Internet, cellphones and smartphones, with younger Americans more likely to own a smartphone. Over the same period, participation in tele-work and e-commerce increased sharply. The advances in Internet and mobile communications are fueling a wave of new transportation services enabled by technology, such as car-sharing, bike-sharing and ride-sharing, the PIRG report finds. Other researchers, including Robert Foss, director of the Center for the Study of Young Drivers at the University of North Carolina, argue that the drop in driving among young people is primarily a function of the economic downturn and is likely to rebound as the economy recovers. Michael Melaniphy, president and CEO of APTA, said the two studies highlight the need for the nation to enact transportation policies that address the needs of Millennials. "Now is the time to be proactive," he said. "Congress should authorize investment in a long-term transportation bill that includes strong investment in public transportation in a variety of modes." Read more in U.S. PIRG's report, "A New Way to Go: The Apps, Maps, and New Technologies that are Giving More Americans Freedom to Drive Less."